April marks the completion of my one year kaiseki cooking class at Better Homes! Yay! The class focused both on cooking techniques and on cha-kaiseki, which I did not know much about. Before taking this class I always thought kaiseki meant intricate culinary art and presentation, but understanding the cha-kaiseki tradition and philosophy opened up a new chapter for me, leading me to learn more about zen and tea. The first day of the class was more than intimidating. A roomful of students all watched the demonstration by the instructor, Chef Nishikawa, for one hour and then were told to complete the entire meal from filleting the fish to making fried tofu balls. But we also had to do it all in one hour, sharing the tasks with three other people in the group I have never met before! When the sensei told the class to have a go at imitating his techniques, I thought I was not ready for this. However, after twelve lessons, I now feel ready for another challenge and am thinking about signing up for Chef Nishikawa’s private classes and another course at Better Homes taught by a different kaiseki chef. Cha-kaiseki (written 茶懐石) is a meal served before starting tea ceremony and has very little room for adaptation or improvisation. Although, hospitality and simplicity are said to be the best ingredients for the meal, traditions observed today follow rigid rules about serving styles and orders from the beginning to the end. For example, out of three rounds of rice served during the meal the first one has to be fresh off the stove, a bit soft, a couple of bite size in long triangle shape or the shape dictated by the tea style the host follows. For the guests, an even greater number of rules apply, such as: what to start with, how not to leave anything on the dishes, or which diner has to mimic the manners of who, and who has to finish everything that has been served. In my next series of Kaiseki posts, I am going to simply describe the cha-kaiseki ichi-ju-san-sai, or the very basic pattern of one soup and three dishes course, and the themes I learned in the class for this past year. Naturally, the themes go according to the tea ceremony chronology. Also, the themes reflect the time of year and ingredients that are in the season, which is the essence of the Japanese culinary tradition. I hope you enjoy this series! Oh, all photos in the series are from the sensei’s demos, not my own group’s creations. The Shoburo tea event celebrates the first use of the Furo (portable brazier) in the New Year of tea. On our modern calendar that would be around May. 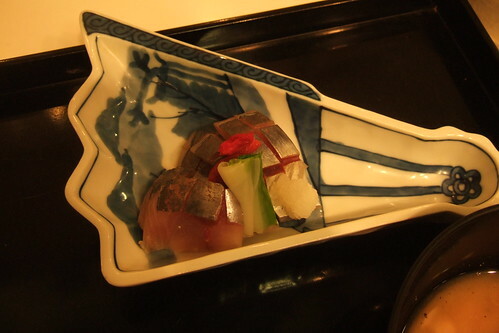 Spanish mackerel fillet is skinned, then lightly marinated in vinegar. Since cha-kaiseki does not use soysauce on the side in a little plate, the fish is sprinkled with light vinegarett with soy sauce, broth, lemon juice and sake. The awase miso used here is mixed – a bit of red miso is added to white miso. 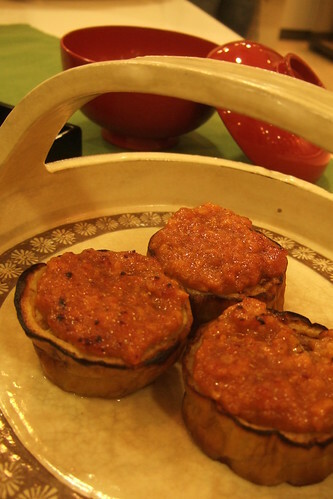 According to the season, different types of miso are used or mixed. Fu here is awa millet mixed with fu or wheat gluten, then steamed. Kogomi is fern sprout or young fern in season in May. 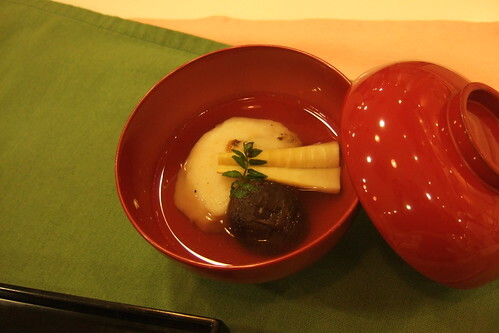 Smooth fish paste and broiled unagi pieces are made into a handful of small ball, cooked in boiling water first, steamed, then served in broth. 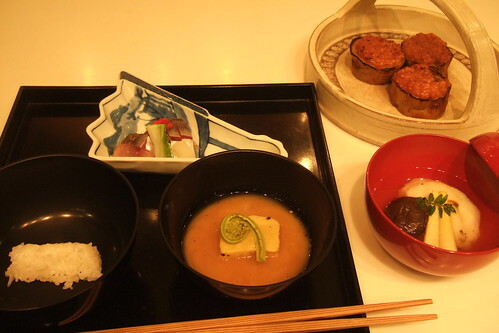 A serving of fluffy unagi shinjo is served with shiitake mushroom and bamboo shoot simmered in broth, then served in broth on the side of the main piece. Why must I leave your posts so hungry? Ha ha. I will add more sake pictures, too! Et-chan, I am so envious, but I guess I’d rather eat it than cook it! Looking forward to the rest of the series!